This White Chicken Chili is always a big hit. It has become a family favorite. 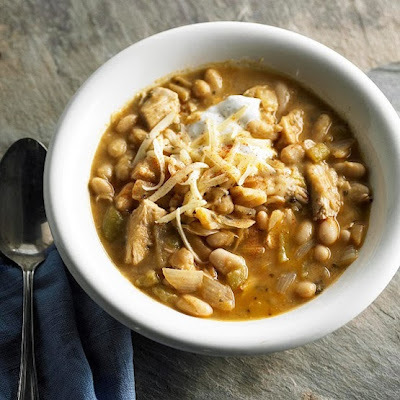 A nice change from the regular tomato based chili with its flavorful blend of tender chunks of chicken, white beans and just enough zip. Additionally, the beauty with chili is you can use whatever you have, add to or take away, to make it your own. So don’t get hung up on exacts. If you only have 2 cans of beans, that works too. Is a half a pound of chicken the only thing you can scrounge up? Make it work! No need to be exact like in baking! 1 cups Daiya (dairy free) "Pepperjack Style Shreds"
In a Dutch oven, cook onions in oil over medium-high heat, stirring occasionally, until tender. Add green chilies, garlic, cumin, oregano, and red pepper flakes; cook, stirring constantly, 2 minutes. Add chicken broth, chicken, beans, and salt and pepper to taste. Bring to a boil, then reduce heat and simmer uncovered for 10 minutes stirring often. Ladle chili into individual soup bowls. Top with cheese. Serve with yogurt, salsa, and chopped fresh parsley or cilantro, so everyone can fix theirs the way they like it best.